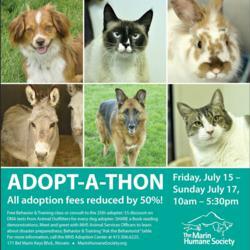 All adoption fees reduced by 50%! The Marin Humane Society (MHS) is helping to celebrate Petfinder.com's 15th birthday by hosting an adopt-a-thon from 10am to 5:30pm, Friday, July 15 though Sunday, July 17. Animal welfare organizations throughout North America and beyond will be participating in this weekend birthday celebration, with a nationwide goal of 15,000 adoptions. For more information, go to MarinHumaneSociety.org or call 415.506.6225. The Marin Humane Society offers refuge, rehabilitation, and support services to more than 10,000 domestic animals and wildlife each year through a myriad of community services, including adoptions, foster care, behavior and training, humane education, pet assistance for people in need, lost-and-found pet services, low-cost clinics, and more. Petfinder, the largest and most successful online venue for adoptable pets, was launched in early 1996 and has facilitated an estimated 17 million adoptions.